We attempt to maintain this list of links and keep it current. If you find any that aren’t working, please let us know. 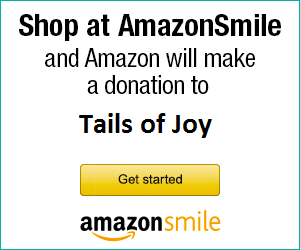 Tails of Joy on Causes — Helping a little helps a lot! Rescue Centers — The most comprehensive animal help site we’ve seen. Much Love Animal Rescue — Bringing love to homeless pets in Los Angeles. Mutt Match LA — An all-breed rescue committed to Rescue, Rehabilitation and Re-homing of abandoned, homeless and unwanted dogs in the Los Angeles area. Leave No Paws Behind — All-breed rescue in the Los Angeles area, specializing in seniors and pets with special needs. When possible LNPB steps up to help save the lives of those that are in most danger of being left behind to die on a cold shelter floor. Seven Colonial — Home and garden decor with a heart. Please support great businesses that support rescue. Urban Dog Barkery — Yummy all-natural pet treats. Strangest Angels Animal Rescue — Los Angeles area animal rescue. Tickled Pink Weimaraner Rescue — A nonprofit, 501(c)(3) rescue organization based in New Mexico, dedicated to helping Weimaraners in need. Woodstock Farm Animal Sanctuary — Promotes farm animal welfare and educates the public about how animals are treated to become our food. Westside German Shepherd Rescue of Los Angeles — Saving the world one German Shepherd at a time. Texas Hearing and Service Dogs — Adopts dogs from shelters and trains them as working partners for Texans with disabilities, free of charge. American Canine Foundation — A non-profit organization that litigates in U.S. courts on behalf of dogs and dogs owners. The Pet Press — California’s only comprehensive pet newspaper, for help, news, events and sources; everything you need to make life better for you and your pets. The monthly in depth cover stories of celebrities and their pets are swell. Greyhound Protection League — Learn about greyhound racing! GREY2K USA — Historic Effort Underway to End The Cruelty of Dog Racing Nationwide. Greyhound Compassion — Rescuing greyhounds throughout the United Kingdom, and fighting animal cruelty all through Europe. Missing Pet Partnership — Nonprofit corporation dedicated to the rapid recovery of missing pets. Northeastern Boxer Rescue — Boxer Rescue covering Connecticut, Delaware, Maine, Maryland, Massachusetts, New Hampshire, New Jersey, New York, Pennsylvania, Rhode Island and Vermont. The Feline Pet Rescue of Staten Island — Feline Rescue of Staten Island rides to the rescue and gets cats out of shelters before they can be euthanized simply for “no space” reasons. Intermountain Therapy Animals — Utah’s oldest and largest organization providing animal-assisted therapy. Wolf Spirits Animal Shelter — Formed for the purpose of rescuing animals from situations that are abusive, endangering and neglectful, which includes puppy mills and backyard breeders. Ohio. Click and Treat — Dog Training that works! Rescue Me Inc. — A non-profit corporation dedicated to the health and welfare of all animals. Farm Sanctuaries Animal Acres — 26-acre Southern California Shelter located on a beautiful hacienda ranch in Acton, just 45 minutes from Hollywood. In addition to providing shelter for more than 100 animals, Farm Sanctuary’s Animal Acres offers one-hour guided tours. It’s the Pits — Dog rescue specializing in the bully breeds.